I just started buying a new Halloween book each year and I love adding to our collection. 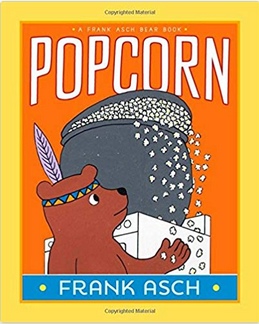 This year I’m going to add Popcorn by Frank Asch because it’s only $4.63 for the hardcover copy! This book is an oldie, but a goodie and is so much fun! The little bear Sam’s parents leave to go to a Halloween party so he decides to have his own bash. All of his friends bring popcorn kernels and they pop every last one….which fills the entire house and they have to figure out how to get rid of all of the popcorn before his parents get home! My kids LOVE this book and will be so happy that we finally own a copy and don’t have to wait for it to be available at the library!